A functioning and powerful storyform carries the message of this film for this generation, and the ones to come. All you really need is a great story. As mentioned in last week’s podcast Zootopia and Batman Begins, I didn’t initially feel like the film’s narrative worked. I felt its storyform was broken. Clearly there was an issue with the Story Limit (which we will get to later), but I also felt that the Throughlines weren’t falling in the right place. Something about it felt off. I wanted to know why the film had scored so high with the critics, especially since that usually signifies a concrete Dramatica storyform. Was it just because there wasn’t anything else out that was good at that time? I can see a film like Inside Out and instantly understand the storyform. With something like Toy Story 3 or Finding Dory I can assuage deficient storyforming in the sequel with love for the characters from the original. But Zootopia was the first of its kind. I couldn’t make heads or tails of it. Another factor behind trying to do an analysis right after a first showing is the relative amount of storytelling noise one has to work through. Character performances, sound design, cinematography—all the great things that go into making a great film can often obscure the actual storyform. The cure lies in giving it some time: Let the noise of the visual splendor die down so you can actually think about the story that was told. This, along with an insightful email from a listener, finally granted me the opportunity to see the arrangement of Throughlines. In fact, once I saw their alignment—I knew exactly what the storyform was, right down to the smallest element. When it happens that fast, I know the storyform is solid. Usually one doesn’t start an analysis by choosing the Throughlines of a story. If you have ever followed along with one of our Dramatica User Group meetings, you know that typically we start out by first identifying the Character Dynamics, then move on to the Plot Dynamics, and finally we end with the Throughlines. We start with the easiest and work our way to the hardest. But the people in those meetings don’t have to come up with a new collection of Throughlines for Throughline Thursdays every Thursday! Putting the Overall Story Throughline in Mind and the Main Character Throughline in Physics narrows Dramatica’s 32,767 possible story forms down to 4,096. Not too bad for two choices. But another interesting thing happens: the application automatically gives Hopps a Main Character Approach of Do-er and a Main Character Growth of Start . Intuitively, this feels right. Hopps prefers to solve her problems externally first (joining the police academy, serving up parking tickets with gusto) and grows by adopting a new characteristic rather than by letting a bad one fall by the wayside. I think this latter is on purpose—it’s not like the filmmakers wanted to portray her as an active racist. Her prejudice is subtle and sublime; it’s not like she is going out and lynching foxes for what they did to her. That would be a Stop character. No, Hopps grows out of her resolve by Starting to see her own way of thinking. That last thought explains the answer to another important story point: the Main Character Resolve. Hopps grows out of her Resolve, moving her from the Domain of Activity into the Domain of Way of Thinking. Instead of seeing her problems as being restricted from doing certain activities, she now sees them more accurately as a deficient way of thinking. This is precisely what happens when a Main Character Changes their Resolve. They move from the Domain they thought the problem was in to the Domain sheltering the Influence Character’s point-of-view. 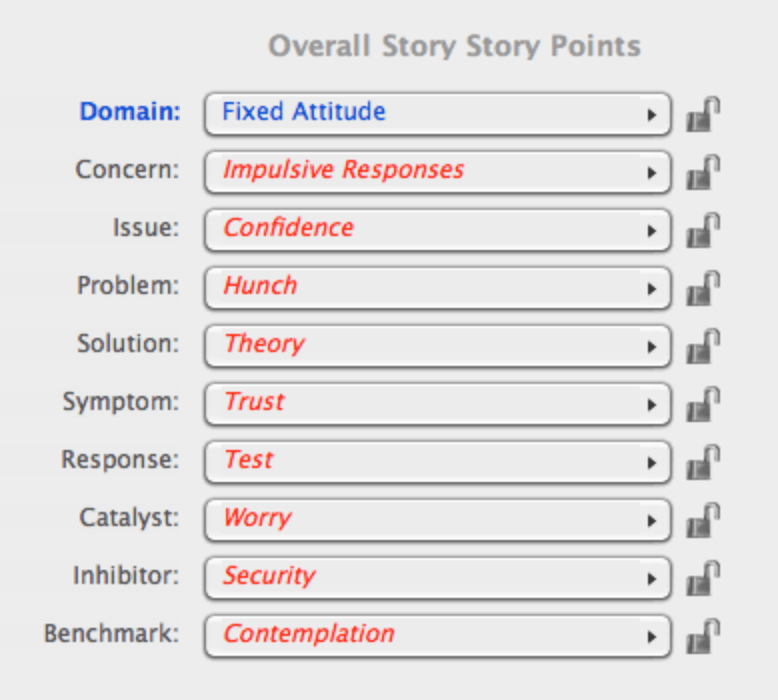 The last Character Dynamic concerns the Main Character Problem-Solving Style and defines whether Hopps solves problems through a Linear cause-and-effect approach, or a more Holistic approach. Hopps goes about solving the case of Emmet Otterton2 in a step-by-step fashion, following the clues and narrowing down the suspects. But look to an even more personal moment with the scene within the elephant ice-cream parlor. A Holistic thinker would totally see the shift in balance going on there and the game Nick was up to. A Linear thinker simply sees a little kid whose dad can’t afford to buy him an ice cream—and Hopps falls for it. Linear thinkers always get themselves into trouble because they can’t see the bigger picture. Hopps is one of those thinkers. For the most part, the Plot Dynamics for Zootopia are simple to ascertain. The story begins and ends with actions (the disappearance of the predators, the apprehension of Bellwhether), the act turns happen because of actions—thus, a Story Driver of Action. Hopps’ Changed Resolve is shown to be a Good thing; she overcomes her own subconscious prejudice and the prejudice of those who could never imagine a “bunny cop”. So, Story Judgment: Good. How about Bellwether’s vision of progress? “90% of the population, united against a common enemy. We’ll be unstoppable.” As Antagonist she works for a Story Consequence of Progress (or How Things are Changing)…and she loses. Hopps, as Protagonist in the Overall Story Throughline, successfully helps everyone overcome their own animal instinct for prejudice by overcoming her own. Thus, a Story Outcome of Success. But then we come to the Story Limit. In Dramatica, the Story Limit defines the scope of the argument, the size of the narrative. Set up within the first Act, this Limit continues to be brought up act-by-act and works as a measure of how close the characters are zeroing in on the moment when they will have to finally face the dilemma. In Zootopia the Story Limit is initially defined as an Optionlock with the context of the missing predators. Like Ten Little Indians, the characters will work their way through each one, eventually coming to a conclusion as to why they all disappeared. The Timelock of 48 hours set by Chief Bogo for Hopps’ personal investigation is really only a storytelling device used to give the middle two Signposts (the traditional Act II) a sense of urgency. It isn’t tied to the larger Overall Story Throughline of prejudice and animal racism. In that regards it is much like the “Timelock” of the original Star Wars. As the Death Star moves in on the rebel planet we are provided a ticking clock scenario—but this vision of time running out is neither tied to the meaning of the entire narrative, nor is it there from the very beginning. Authors can set all kinds of diminishing options and dwindling clocks within the context of storytelling and not affect the overall meaning of a story. What they can’t do is set up a Story Limit, and then disregard it as if it never really mattered. This is what Zootopia does. They set up the original Optionlock of the missing predators, but the moment they find Emmet Otterton and end their investigation the story is over. At least, that was the promise the authors made to the audience during the first Act. Ending the story at that moment when clearly there is more left to tell leaves an informed audience lost and searching for meaning. In short, they wonder when the damn thing will end. The fallback is “when the bad guy is caught”. But stories are not supposed to be about catching bad guys, especially a story as sophisticated in its structure as Zootopia. This Story Limit problem breaks what would otherwise be a perfect film. Like Pixar’s Ratatouille—which suffered the same exact problem of sophistication with a broken Story Limit—the film slows down and loses focus as the audience realigns what they thought the film was supposed to be about with what it obviously will be about. The reveal of Bellwether as bad guy is a foregone conclusion. Of course she is behind it all. And not because it’s a storytelling trope that migrated down from the Bay Area. No, everyone knows it is coming because that is the only option left. It simply becomes a matter of waiting it out until the credits start to roll. Fixing this problem would have been as easy as it would have been to fix in the Keanu Reeves’ masterpiece Speed—another film that suffered from a broken Story Limit. Save Emmet Otterton’s rescue until after Bellwhether’s arrest. In this way, the filmmakers would have been able to maintain the trust between Author and Audience by crafting a bulletproof narrative. You would think that determining the Character and Plot Dynamics and defining the Four Throughlines of a story would be enough when it comes to nailing down the storyform of a narrative…but it’s not. It really is only the beginning. From there you need to dive down into the dramatic structure of the narrative in order to get to the bottom of what is causing trouble for everyone. The Throughlines sit at the Domain level of the Dramatica Table of Story Elements. 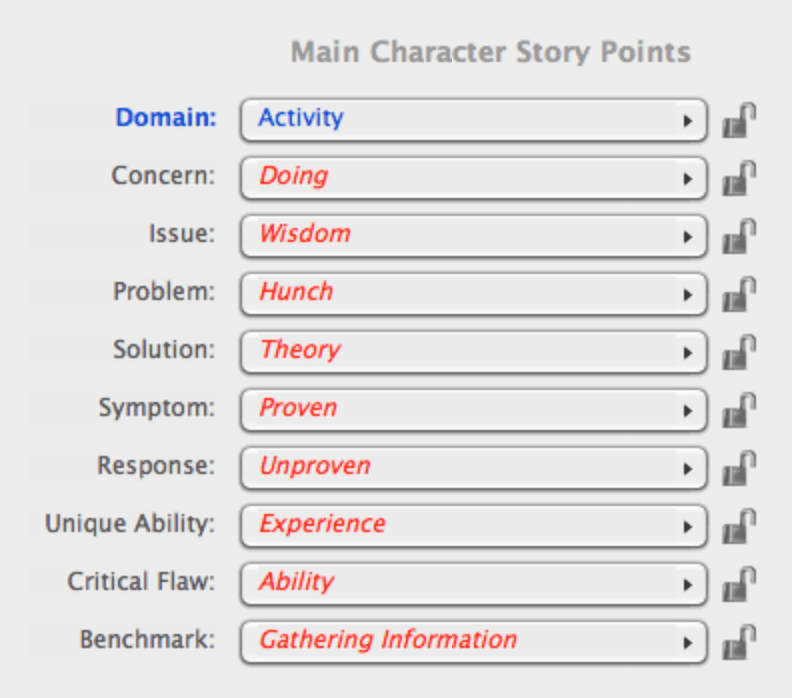 Below that we have the Concern level which is closest to Plot, the Issue level below that which is closest to Theme, and finally at the very bottom we have the Element level which is where you will find Character. Typically we start by identifying the Concerns and working our way down and this was alluded to, in part, in the post on The Throughlines of Zootopia. But I thought it might be interesting to show how I discovered the final storyform as I actually started at the bottom of the chart and worked my way up. For many the following might be difficult to follow and technical at times in its approach. The one thing you have to remember is to always look for trouble. Zero in on the problem areas and the narrative will leap out at you. 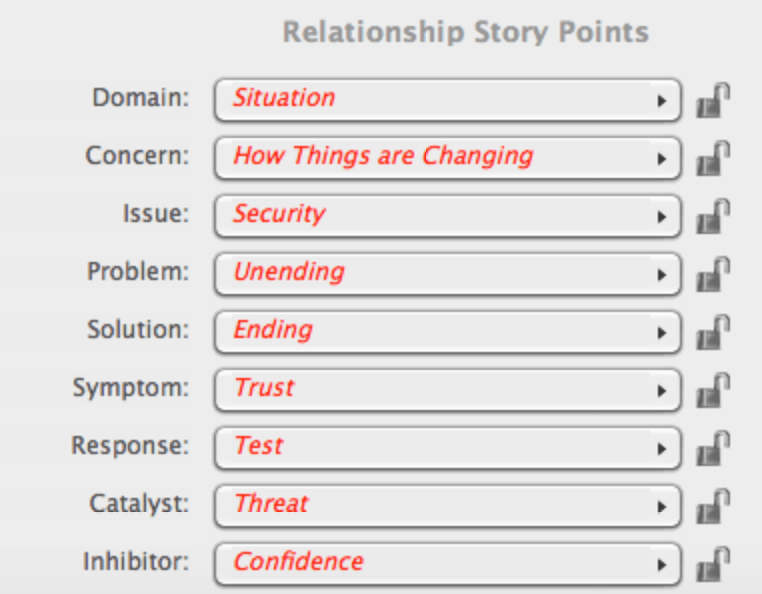 The storyform defines the source of conflict within a story. Find the trouble and you will find the storyform. Once I aligned the Throughlines in their proper arrangement, I went instantly to Nick. His line “Everyone comes to Zootopia thinking they could be anything they want. But you can’t. You can only be what you are” screams out an Influence Character Problem of Determination. As far as Nick is concerned, your lot in life is predetermined and there is nothing you can do about it. This viewpoint challenges Hopps and represents the heart of his influence. Selecting this in Dramatica does something really quite remarkable. Before making the selection we still had 64 possible storyforms remaining. Once we select Determination for the Influence Character Problem the number of remaining storyforms is one. 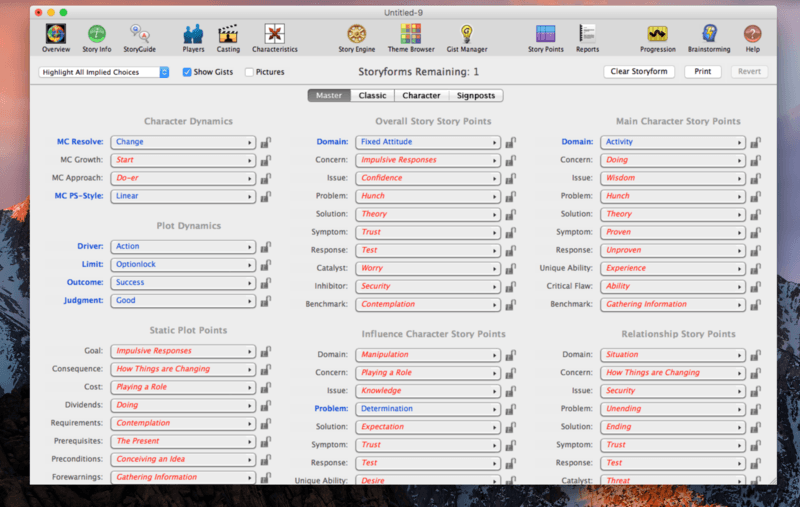 By making one selection, we aligned the entire rest of the narrative and moved from 64 possible storyforms down to the one and only. Choices in Blue were choices I made. Choices in Red were the answers to story points that Dramatica predicts you would find in the rest of Zootopia. 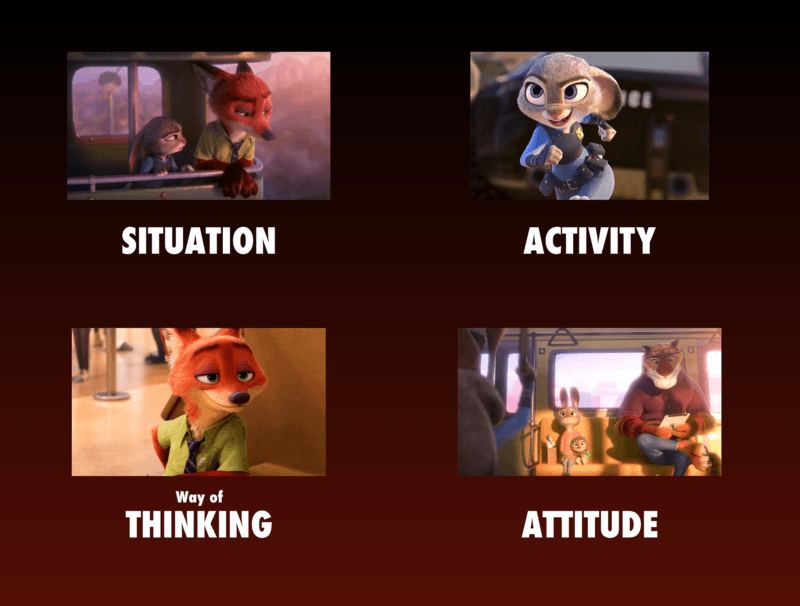 By running through these Red options and testing them against your own experience with the film, you can see whether or not this is the actual collection of deep thematic story points resting at the bottom of Zootopia’s structure. The choice of Determination as his Problem, or driving force, puts his Symptom—the thing he sees as the problem—into Trust and his Response to that problem into Test. This is totally Nick. If you asked him what is wrong, he would tell you that you can’t trust anyone and that you’re a dummy if you’re not working some kind of angle. That’s a Symptom of Trust and a Response of Test. 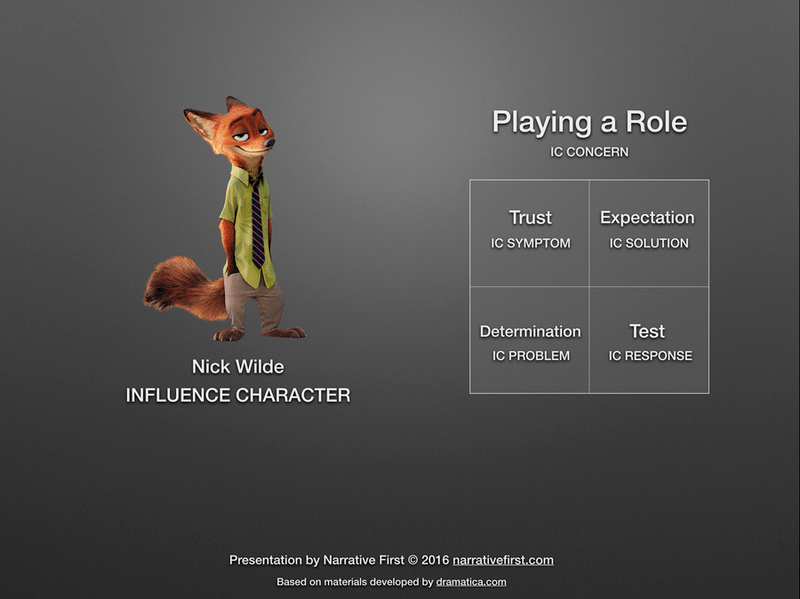 It also forces his Influence Character Concern into Playing a Role, which was suggested in the post on the Four Throughlines of Zootopia. A fun thing to do with Dramatica is to hold off on making choices that you’re pretty sure about, but don’t know for sure. Playing a Role sounded great for Nick, but I would rather have Dramatica confirm that rather than force it into being. Selecting Determination the way I did as his Problem flipped the switch on Playing a Role, confirming my own writer’s intuition. Moving over to the Overall Story Throughline we see a Concern of Preconscious and a Problem of Hunch. The central problem for everyone in the story and the thing they all have to overcome is that basic animal instinct for survival. The film is a commentary on our own prejudices and that hunch, or intution that someone different than us is out to get us, is baked right into the structure of the narrative. You can also see how a Catalyst of Worry and an Inhibitor of Security totally matches what we see in the film. Anytime an action is taken because someone is worried about what will happen, conflict increases. Anytime they try to protect themselves and increase the relative safety of everyone around them (Judy resigning) the conflict in the story slows to a crawl. And then look at Hopps’ Main Character Throughline. Again, her Problem is that animal instinct—or Hunch—that something is amiss. That justification to always be wary, built up by her parents and reinforced by her encounters with a fox when she was younger, fuels that personal problem of hers. Anytime you see her nose twitch—you’re seeing that justification of Hunch at work. Hopps doesn’t recognize her own problem because she is too focused in on the fact that she hasn’t proven herself yet. And she answers this Main Character Focus of Proven with amazing feats that no bunny has ever performed before (Main Character Response of Unproven). Her Main Character Issue of Wisdom again plays into that perspective her parents conditioned her with about being wise around those who would do you harm. Which brings us to the Relationship Story Throughline. As mentioned in the Throughlines of Zootopia post, the relationship between Hopps and Nick is in conflict because of their physicality: a fox and a rabbit. Mortal enemies forced into working with one another. We can easily see their Relationship Story Symptom and Relationship Story Response of Trust and Test in the guise of their distrust of one another and their constant challenging of the others’ true nature. But take a look at what Dramatica predicts their greatest Issue to be: Security. You would think Threat would be a greater Issue for them, and it does come up in the form of the Relationship Story Counterpoint, but the real source of problems between them rests in this need to feel safe. And that represents the true heart of the message behind Zootopia. In our need to feel safe around one another, we impulsively engage in prejudiced behavior—bringing hurt to those most like us. Nick is Hopps. He just has developed a different way of approaching those big picture problems. The biggest gut punch in Zootopia, the one that stings the most, is the reveal that Hopps still carries around Fox Spray, even when she claims Nick a friend. It’s that Hunch creeping in. And it hurts because it reveals just how insecure their relationship truly is. Overcoming that need to feel safe, and Ending a life’s worth of prejudice not only resolves the Relationship Throughline through the Relationship Story Throughline Solution, but also provides a solution for resolving our own interpersonal relationships. There is a code to telling a story, a narrative form that communicates the intention and heart of an author. Zootopia connects with so many because of how accurately it follows the storyform setup by its Throughlines, Character, and Plot Dynamics. While it suffers from a broken Story Limit, this rather minor oversight only diminishes the entertainment value of the story—the message still comes through loud and clear. 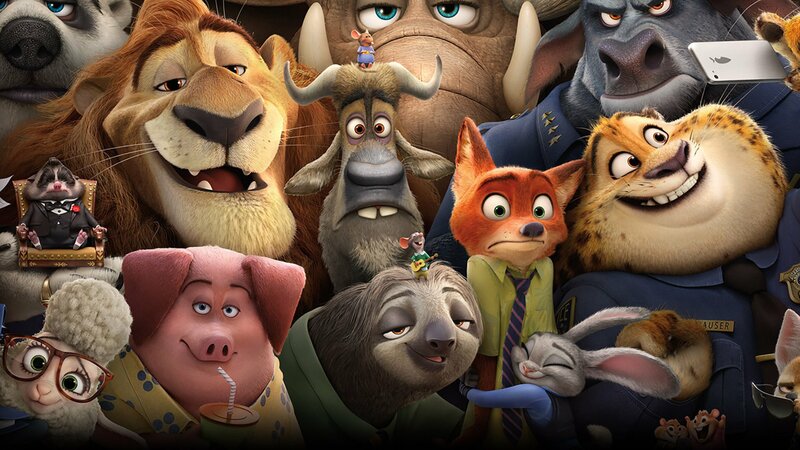 Zootopia will continue to connect with audiences generations from now as it is not based on the current cultural climate, but rather familiar thematic issues that we all experience in our own lives. Great stories teach us a different way and offer a solution to resolving our greatest differences. Animation is often thought of as a medium solely for children. In this case, that might not be such a bad thing. Imagine an entire generation influenced by the relationship between Nick and Hopps to overcome their own personal prejudice and misguided intuition. That brave new world will have a great and functioning story to thank for their prosperity.